Prescription Dysport® is an injection used to temporarily improve the look of your moderate to severe frown lines without changing the look of your whole face. The untreated facial muscles still work normally, allowing you to freely show facial expressions, such as smiling, in untreated areas. Get to know more about Dysport® , including how it works and what to understand before you start treatment. When considering any kind of aesthetic treatment, it’s important to understand as much as possible about the procedure, and what you can expect from the results. This useful guide can help you learn more about the Dysport® treatment process, before you discuss it with your doctor. Discuss your expectations with your doctor and whether you have any health conditions or allergies that could interfere with your treatment. It’s your appointment, so don’t hesitate to ask your doctor questions. Effective treatment requires 1 injection into each of 5 points between and over the eyebrows. Although office visit times vary, the procedure generally takes 10 to 20 minutes. Your healthcare professional will determine the exact placement of each injection to get results that are right for you. Ask your doctor about any precautions you should take after treatment. Call your doctor or get medical help right away if you have any problems swallowing, speaking, or breathing. If this happens, do not drive a car, operate machinery, or do other dangerous activities. To maintain your improvements, you should discuss a treatment schedule with your doctor. As with any botulinum toxin product, you should wait at least 90 days between treatments. Ask your doctor if prescription Dysport® is right for you. Dysport® may not be right for you if: you have surgical changes to your face, very weak muscles in the treatment area, your face looks very different from side to side, the injection site is inflamed, you have droopy eyelids or sagging eyelid folds, deep facial scars, thick oily skin, or if your wrinkles can’t be smoothed by spreading them apart. See below for Dysport® Important Safety Information, including Boxed Warning, and Medication Guide. 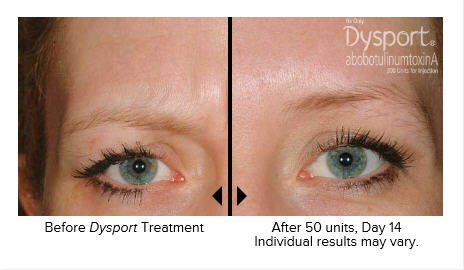 If you’re serious about treating your frown lines, talk to your doctor about Dysport® . It may just be the right treatment option for temporarily improving moderate to severe frown lines. The information in this article was taken from http://www.dysportusa.com/dysport/ . Visit the Dysport® website for more great information.